Apart from mapping the categories, the attribute mapping is also important when the store owners have variation products. 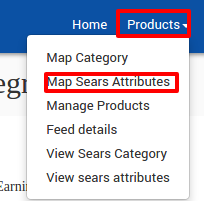 Before uploading the variation products to the Sears marketplace, they need to map the attribute of their products to the Sears attributes. Scroll down to the required Sears Attribute Name row to map the respective attribute and the values to the corresponding BigCommerce Options. In the BigCommerce option column of the respective row, select the dropdowns associated with the required options. A message appears as the category attributes are mapped successfully.